11th lunar month of 1800: he appears on stage for the first time, in Ôsaka at the Takeda no Shibai, where he receives the name of Arashi Tokusaburô II. 1800 ~ 1819: he spends the first twenty years of his career in Kamigata, playing at the beginning in children-troupe, then in travelling troupe performing in the precincts of temples or shrines in the Kyôto area or in Ôsaka minor theaters (hama shibai). 1819: he temporarily takes the name of Arashi Jusaburô I. 1820: he takes back the name of Arashi Tokusaburô II. Fall 1820: he goes to Edo, along with Nakamura Gennosuke I and Arashi Ryûgorô, to perform at the Nakamuraza. 11th lunar month of 1820: Tokusaburô plays at the Nakamuraza the roles of the yakko Yatahei and Genjûrô in the drama "Saruwaka Hisago no Gunbai". 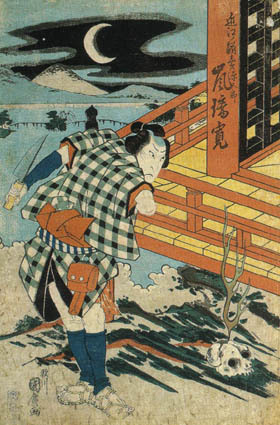 9th lunar month of 1821: Arashi Kitsusaburô I dies in Ôsaka. 7th lunar month of 1822: Tokusaburô plays at the Nakamuraza the roles of Sasaki Tan'emon, Honda Dainaiki and Yamada Kôbê in the drama "Igagoe Dôchû Sugoroku". Summer 1822: Tokusaburô goes back to Ôsaka. 9th lunar month of 1822: Arashi Tokusaburô II takes the name of Arashi Kitsusaburô II at the Naka no Shibai, playing the roles of Yorimasa and Hayata in the drama "Yorimasa Nue Monogatari", which commemorates the 1st anniversary (2nd memorial service) of late Arashi Rikan I. 4th ~ 6th lunar months of 1828: tour in Nagoya for a troupe led by Kitsusaburô, Sawamura Kunitarô II and Ôtani Tomoemon II; they perform at the Tachibana no Shibai in dramas like "Hirakana Seisuiki", "Kuni Namari Futaba no Oizuru", "Katakiuchi Ura no Asagiri" or "Onna Hachinoki". 8th lunar month of 1828: Arashi Kitsusaburô II takes the name of Arashi Rikan II at the Kado no Shibai, playing the roles of Saitô Tarô Saemon and Rimpei in the dramas "Ôtô-no-Miya Asahi no Yoroi" and "Otoko Narikeri Onna Narukami", which are produced by Sawamura Otomatsu and commemorate the 6th anniversary (7th memorial service) of late Arashi Rikan I. His stage partners are Bandô Jutarô I, Sawamura Kunitarô II, Ôtani Tomoemon II and Asao Okuyama III. 1st lunar month of 1829: Rikan's rank in the Kamigata hyôbanki, tachiyaku section, is jô-jô-kichi (superior - superior - excellent). 5th lunar month of 1829: Rikan plays at the Kitagawa no Shibai the role of Izumi no Saburô in the drama "Yoshitsune Koshigoejô"; The role of Gotobê is played by Kataoka Nizaemon VII. 9th lunar month of 1829: Rikan plays the role of Utanosuke in the drama "Keisei Hangonkô", which is produced at the Kado no Shibai by Nakamura Umematsu; his stage partners are Nakamura Utaemon III (Matahei), Nakamura Matsue III (Otoku) and Kataoka Nizaemon VII (Shôgen). The play is played in the 11th lunar month with the same casting at the Kitagawa no Shibai (Kyôto). 1st lunar month of 1830: Rikan's rank in the Kamigata hyôbanki, tachiyaku section, is hakushi-jô-jô-kichi (almost unique - superior - superior - excellent). He plays at the Kado no Shibai the roles of Mashiba Hisatsugu, Gengorô, Takagi Jirodayû, Iwaki Taemanojô and Miura Tatewaki in the drama "Keisei Setsugekka", sharing the stage with Matsumoto Kôshirô V, Nakamura Utaemon III, Ichikawa Hakuen II, Kataoka Nizaemon VII and Nakamura Matsue III. Spring 1830: tour in Ise and Matsuzaka. 9th lunar month of 1830: Rikan plays at the Kado no Shibai the roles of Osome and the yakko Yokanpei in the drama "Ashiya Dôman Ôuchi Kagami"; the role of Kuzu-no-Ha is played by Sawamura Kunitarô II. 11th lunar month of 1830: Rikan plays at the Kitagawa no Shibai the roles of Takebe Genzô and Umeômaru in the classic "Sugawara Denju Tenarai Kagami". He also plays the role of Kajiwara Heizô Kagetoki in "Yoshitsune Senbon Zakura", which is staged at the end of the program. 1st lunar month of 1831: Rikan plays at the Kado no Shibai 3 roles in the drama "Keisei Sato no Odamaki", which is produced by Arashi Tokusaburô III, sharing the stage with Onoe Kikugorô III, Kataoka Nizaemon VII and Asao Gakujûrô. 7th lunar month of 1831: Rikan plays at the Kado no Shibai the role of Sasaki Moritsuna in the drama "Ômi Genji Senjin Yakata". 9th lunar month of 1831: Rikan plays in the same theater 2 roles in the drama "Chûkô Homare no Futamichi". 11th lunar month of 1831: Rikan plays at the Kitagawa no Shibai the roles of En'ya Hangan, Amakawaya Gihei, Ono no Sadakurô, Yoichibê, Teraoka Heiemon, Horibe Yajibê and wakatô Takunai in the classic "Kanadehon Chûshingura". 1st lunar month of 1832: Rikan's rank in the Kamigata hyôbanki is shi-jô-jô-kichi (unique - superior - superior - excellent). He plays at the Ônishi no Shibai the role of Miyamoto Musashi in the drama "Katakiuchi Nitô Eiyûki", which is produced by Arashi Kitsunosuke. 3rd lunar month of 1832: Rikan plays in the same theater in the drama "Tsukushi no Tsumagoto Asagao Nikki". 5th lunar month of 1832: Rikan plays in the same theater the role of Danshichi Kurobê in the drama "Natsu Matsuri Naniwa Kagami"; his stage partners are Iwai Shijaku I (Issun Tokubê) and Kataoka Nizaemon VII (Tsuribune Sabu). He also plays in "Yoshiwara Saiken no Zu". 8th lunar month of 1832: Rikan plays at the Naka no Shibai in the drama "Ehon Tengajaya-mura", which is produced by Arashi Takejirô. 11th lunar month of 1832: Rikan plays at the Kitagawa no Shibai the role of Miyamoto Musashi in the drama "Katakiuchi Ganryûjima". 1st lunar month of 1833: Rikan plays at the Naka no Shibai the roles of Oguri Hangan and Namishichi in the drama "Hime Kurabe Futaba Ezôji". 5th lunar month of 1833: Rikan plays at the Kado no Shibai the role of Watônai in Chikamatsu Monzaemon's drama "Kokusen'ya Gassen". 7th lunar month of 1833: Rikan plays at the Kitagawa no Shibai the roles of Watônai and Asaina Tôbê in the dramas "Kokusen'ya Gassen" and "Gokusaishiki Musume Ôgi". 9th lunar month of 1833: Rikan plays at the Naka no Shibai the role of Mohei in Chikamatsu Monzaemon's drama "Daikyôji Mukashi Goyomi"; the role of Osan is played by Iwai Shijaku I. 1st lunar month of 1834: Rikan's rank in the Kamigata hyôbanki, tachiyaku section, is hakudai-jô-jô-kichi (almost grand - superior - superior - excellent). He plays at the Naka no Shibai the roles of Sankichi, Yurugi Saemon and Hachizô in the drama "Keisei Somewake Tazuna". 5th lunar month of 1834: Rikan plays at the Naka no Shibai the roles of Wada Yoshimori, Kajiwara Heiji Kagetaka, Matsuemon and Higuchi Jirô Kanemitsu in the drama "Hirakana Seisuiki". 6th lunar month of 1834: Rikan plays at the Wakadayû no Shibai (Ôsaka) the roles of the sumô wrestler Iwakawa Jirokichi and the warrior Saitô Bettô Sanemori in the dramas "Sekitori Senryô Nobori" and "Genpei Nunobiki no Taki". 8th lunar month of 1834: Rikan plays at the Ônishi no Shibai the role of Ume no Yoshibê in the drama "Suda no Haru Geiko Katagi". 9th lunar month of 1834: Rikan plays at the Ônishi no Shibai the roles of Karaki Masaemon and Sasaki Tan'emon in the drama "Igagoe Norikake Gappa". The troupe moves to the Naka no Shibai and performs the same play in the 10th lunar month. Then, the troupe finally moves to the Minamigawa no Shibai and performs the same play in the 11th lunar month. 11th lunar month of 1834: Rikan also plays in the same theater the roles of Fukashichi and Mohei in the dramas "Imoseyama Onna Teikin" and "Daikyôji Mukashi Goyomi". 1st lunar month of 1835: Rikan plays at the Naka no Shibai the roles of Kikkawa Kagetô and Tajima in the drama "Keisei Hanafusa Sôshi". 3rd lunar month of 1835: Rikan plays at the Naka no Shibai the roles of Takebe Genzô, Matsuômaru and Terukuni in the classic "Sugawara Denju Tenarai Kagami". 4th ~ 6th lunar months of 1835: tour in Nagoya (Wakamiya no Shibai) with Nakamura Karoku I and Arashi Sangorô IV. 7th lunar month of 1835: tour in Kuwana. 8th lunar month of 1835: Rikan plays at the Naka no Shibai the roles of Hirai Gonpachi and Konoshita Tôkichi in the dramas "Hiyokumon Sato no Nishikie" and "Konoshita Kage Hazama Gassen". 10th lunar month of 1835: Rikan plays at the Naka no Shibai the roles of Momonoi Wakasanosuke, Yashichi and Yajibei in the drama "Taiheiki Chûshin Kôshaku". 11th ~ 12th lunar months of 1835: Rikan plays at the Naka no Shibai the roles of Taira no Atsumori and Washio no Saburô in the drama "Suma no Miyako Genpei Tsutsuji". 1st lunar month of 1836: premiere at the Naka no Shibai of Nishizawa Ippô's drama "Hana no Ani Tsubomi no Yatsufusa"; Rikan plays the roles of Kanamari Daisuke and Inuzuka Shino [casting]. He suddenly falls ill and has to be replaced by Arashi Rikaku II. 8th lunar month of 1836: Rikan plays at the Naka no Shibai the role of Aburaya Yohei in the drama "Abura Akindo Kuruwa Banashi". 1st lunar month of 1837: Rikan's rank in the Kamigata hyôbanki, tachiyaku section, is dai-jô-jô-kichi (grand - superior - superior - excellent). Rikan plays at the Kado no Shibai the roles of Sasahara Hayato and Demura Shinbê in the dramas "Keisei Ogura Shikishi" and "Koi Minato". 5th lunar month of 1837: Rikan appears on stage for the last time, at the Ônishi no Shibai, playing the role of Tamiya Genhachirô in the drama "Katakiuchi Noriai Banashi". He suddenly falls ill and dies in June. His tombstone is located in Ôsaka in the precinct of the Jôgenji temple. Arashi Rikan II was an outstanding and popular actor, able to play any kind of tachiyaku role in any jidaimono or sewamono drama, excelling in jitsugotoshi, wagoto, sumô wrestler and oyajigata roles. He was an actor of small stature but was endowed with a pair of big and expressive eyes (his nickname Metoku comes from the word me meaning eye and toku, the first ideogram of his first name Tokusaburô). His looks was said to be as amazing as Nakamura Utaemon III's looks. The 13th day of the 6th lunar month of the 8th year of the Tenpô era was the 15th of July 1837 in the western calendar.